Aiwis, the ultimate marketing solution for your business needs. 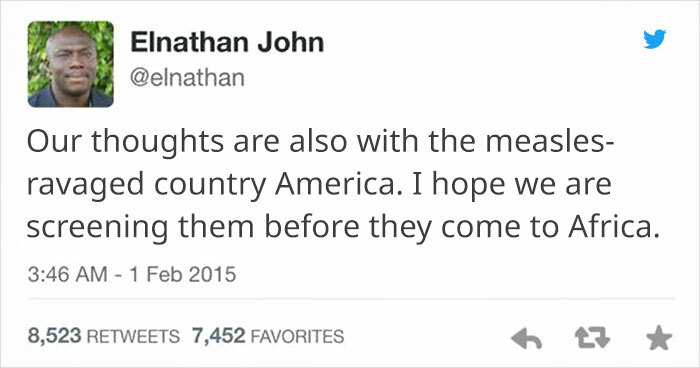 Marketing materials, case studies, all the marketing material you need to kickstart your video marketing career, and be able to start landing clients right away with no need for you to have to create your own material... brand new to video marketing..
Elnathan John, a Nigerian writer and lawyer, called out American’s who wanted travel bans on countries with Ebola by pointing out the current measles outbreak. 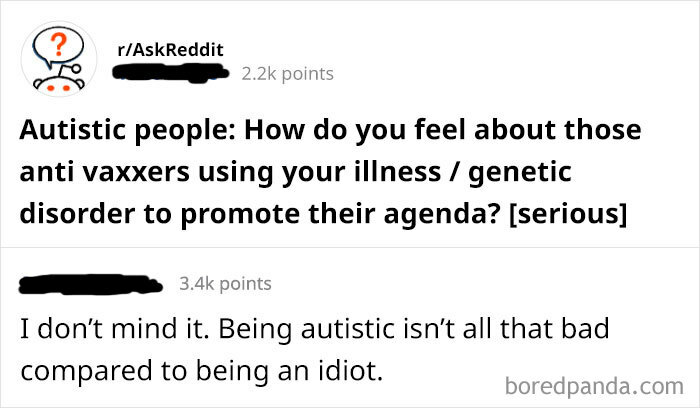 Many anti-vaxxers use the possibility of having an autistic child as one of their debate points – but this autistic person had a counterpoint. 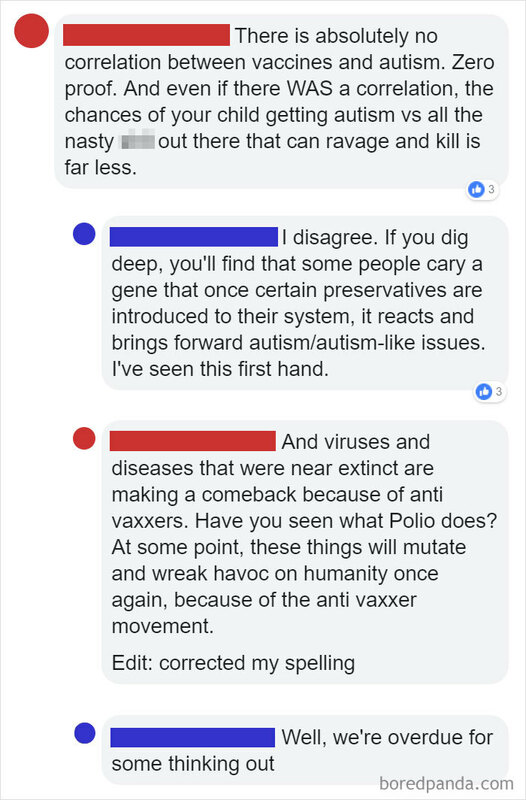 An argument for not vaccinating kids is that it’s more natural and therefore healthier- well this user points out that humans created vaccines for a reason. 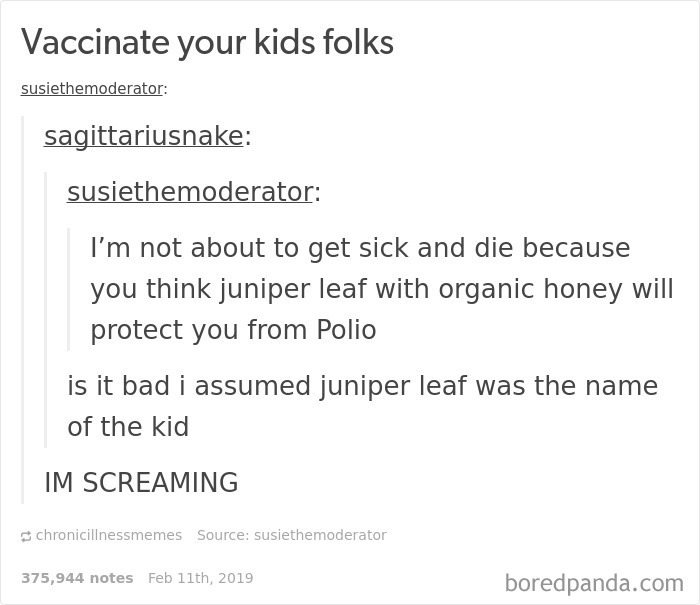 Anti-vaxxers say they want to return to a simpler, more ‘natural’ time – well this user had some holes to poke in that theory. 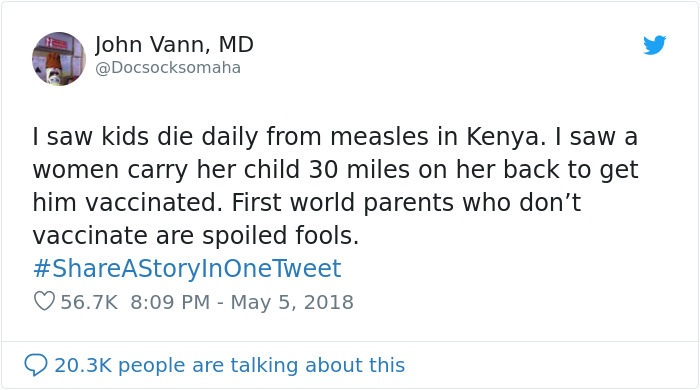 Approximately 110 000 people died from measles in 2017 – mostly children under the age of 5 years according to the World Health Organization. 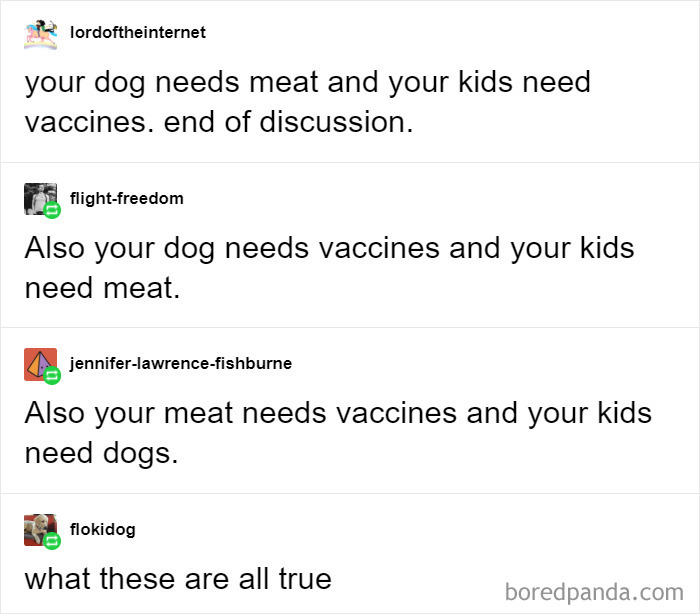 Internet user highlights exactly how necessary vaccines are and other commenters jump in with equally valid comparisons. 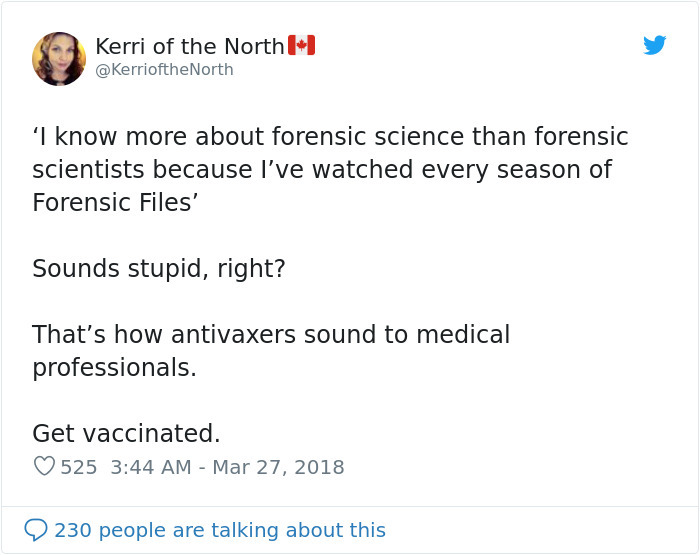 This user pointed out that just because you have googled information about vaccines on the internet does not mean you know more than doctors. 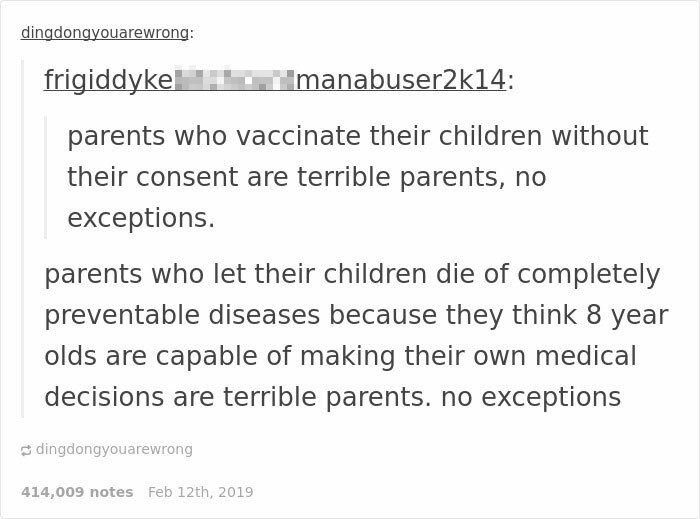 Parent brings child consent into the vaccine debate and gets shot down with the perfect answer. 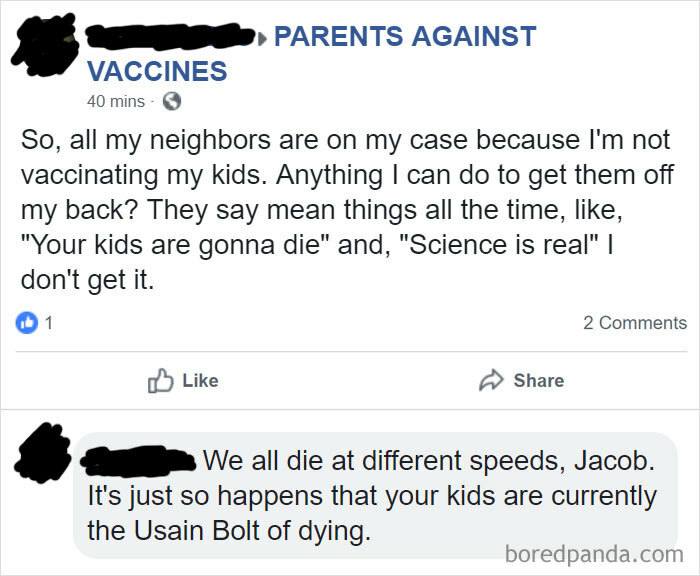 Parent in an anti-vaxxing Facebook group seeks advice against judgmental neighbors – and receives an unexpected response. 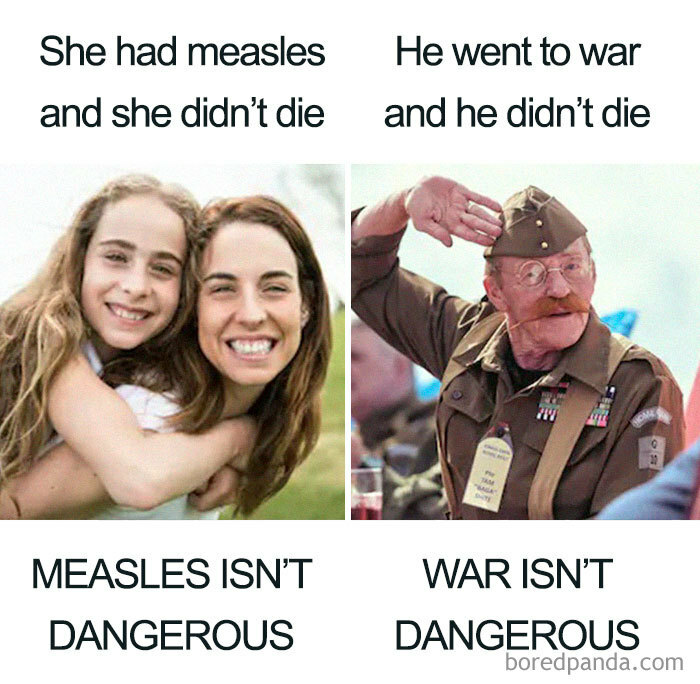 Anti-vaxxers try to create false equivalencies and are shut down through memes. 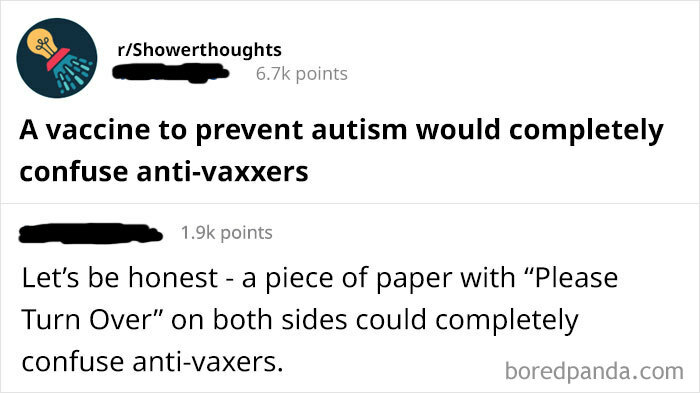 Internet user fights back against debate point that vaccines cause autism with the perfect question. 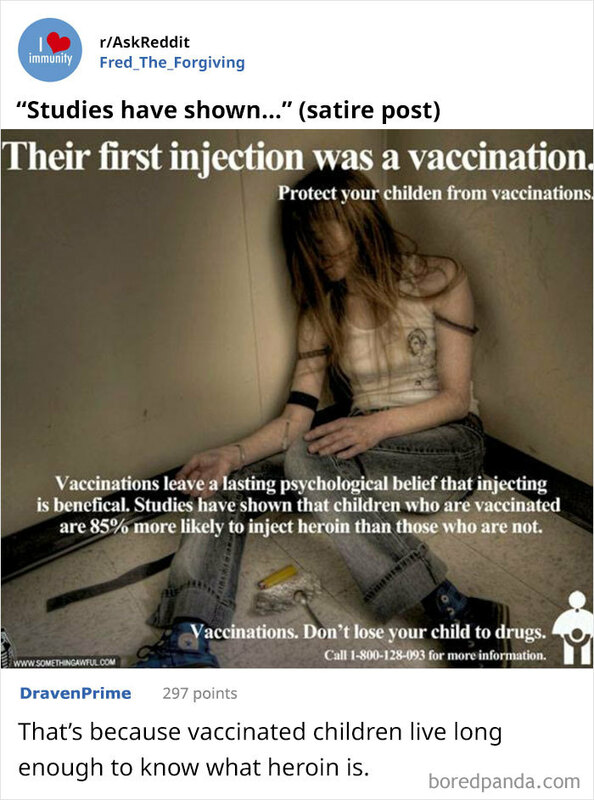 Someone tried to create a shocking poster linking heroin use to vaccines, but not everyone was convinced. 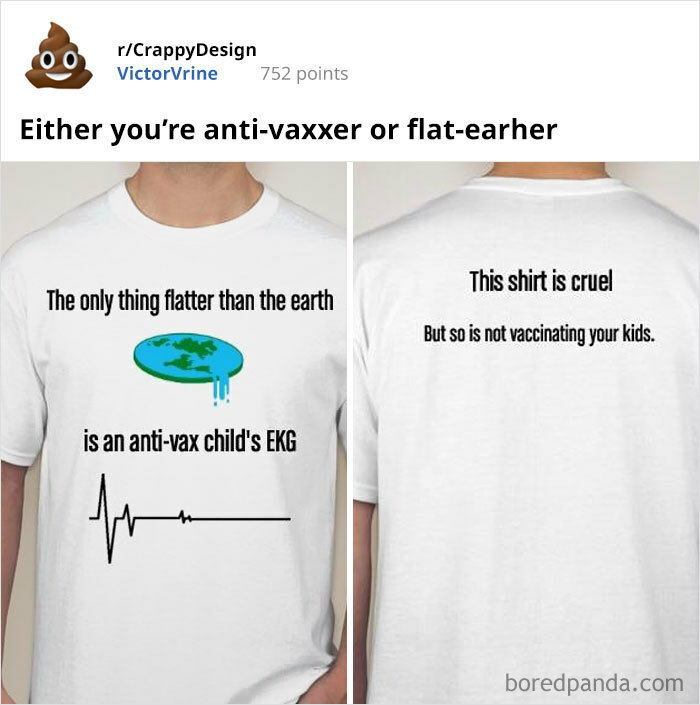 Someone creates a shirt with the two most popular conspiracy theories in one place. 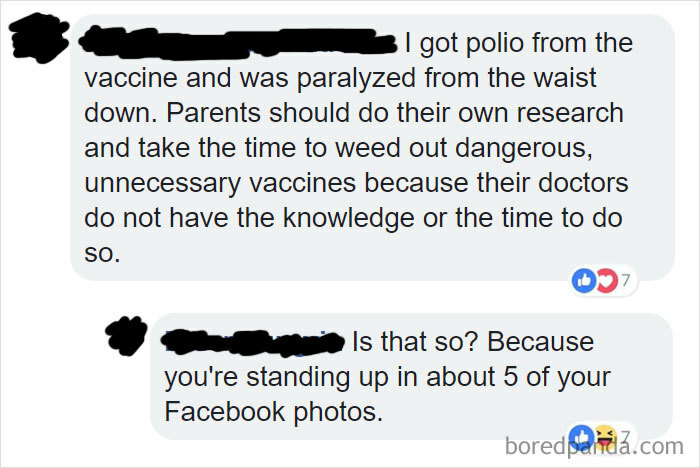 Anti-vaxxer tries to spread fake news and conspiracies about the side-effects of vaccines and gets fact checked. 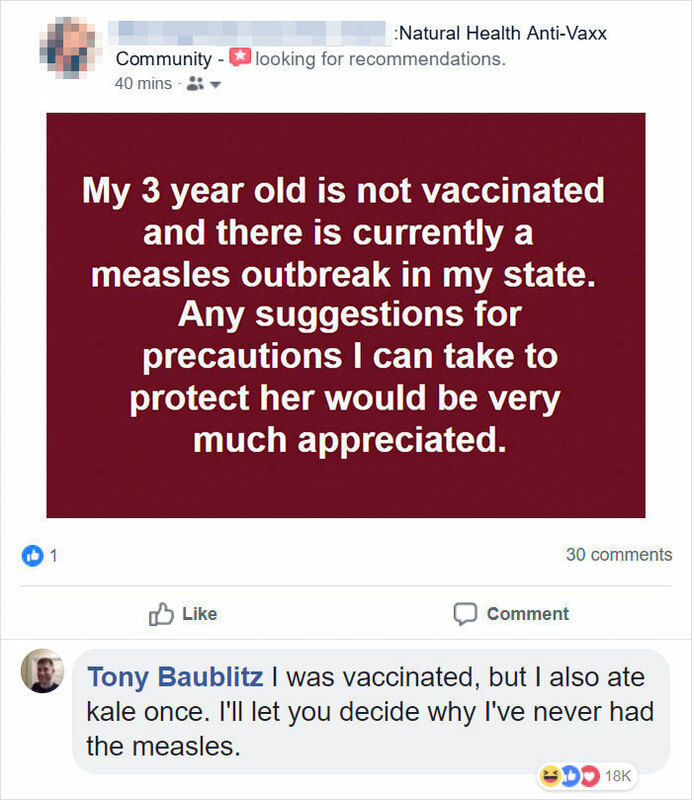 Someone asks for a suggestion for preventing measles other than a vaccine and another user has this ‘healthy’ recommendation. 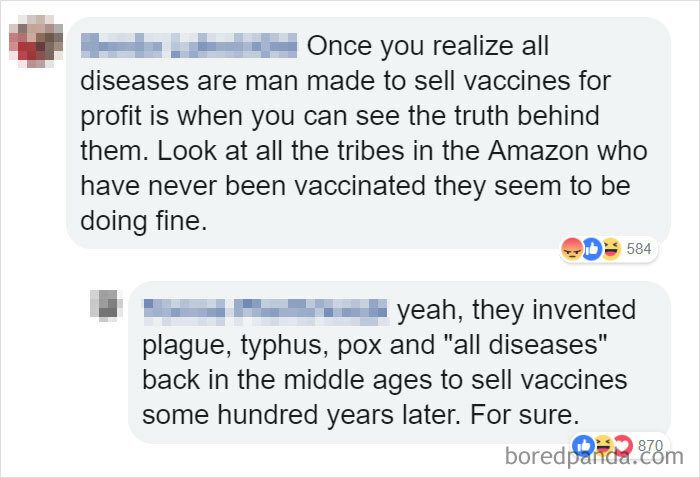 Anti-vaxxer posts conspiracy about vaccines only being sold in profit scheme and gets shut down. 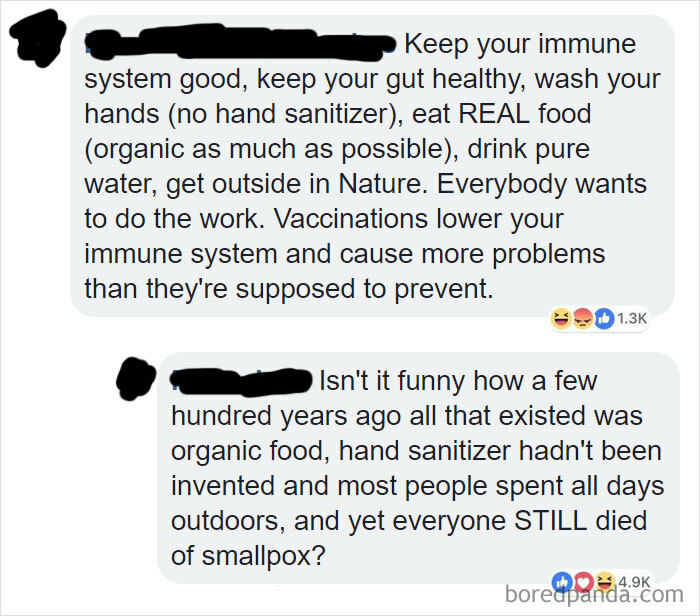 An educator shuts down a anti-vaxxer conspiracy theorist in long, fact based post. 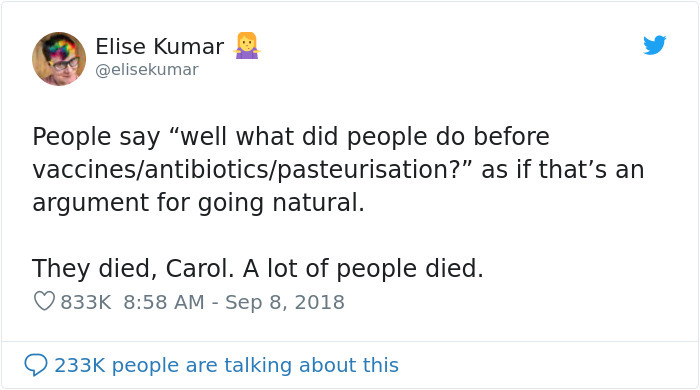 Sometimes names can be confusing. 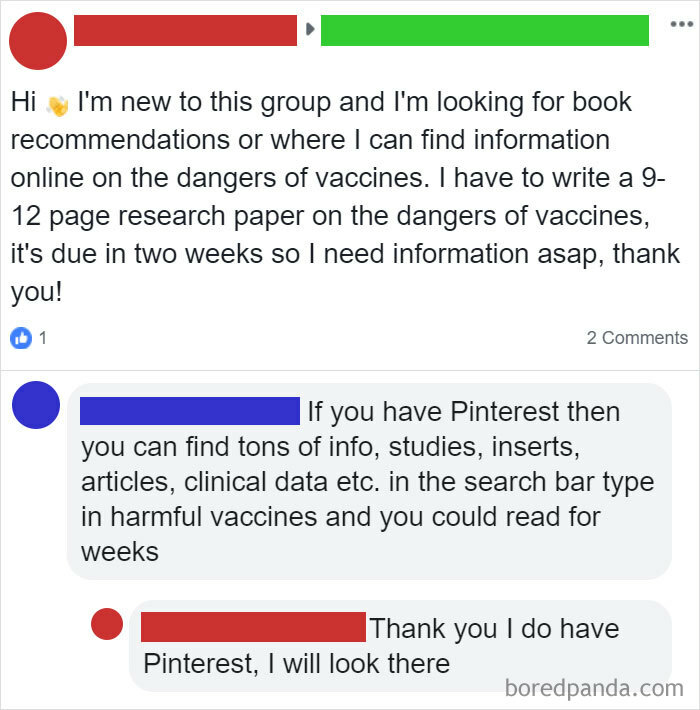 Pinterest is not just for arts and crafts anymore. 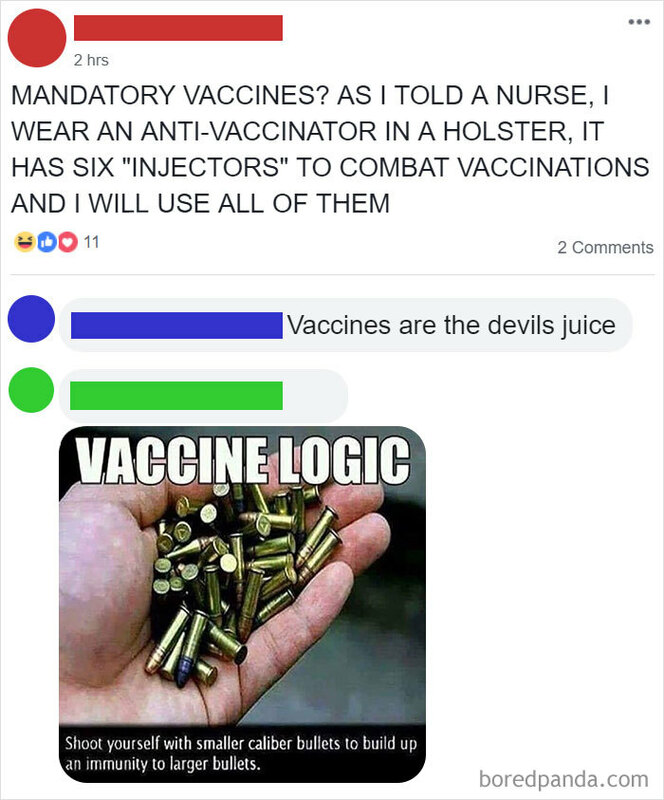 This anti-vaxxer is ‘armed’ and dangerous against disease apparently. 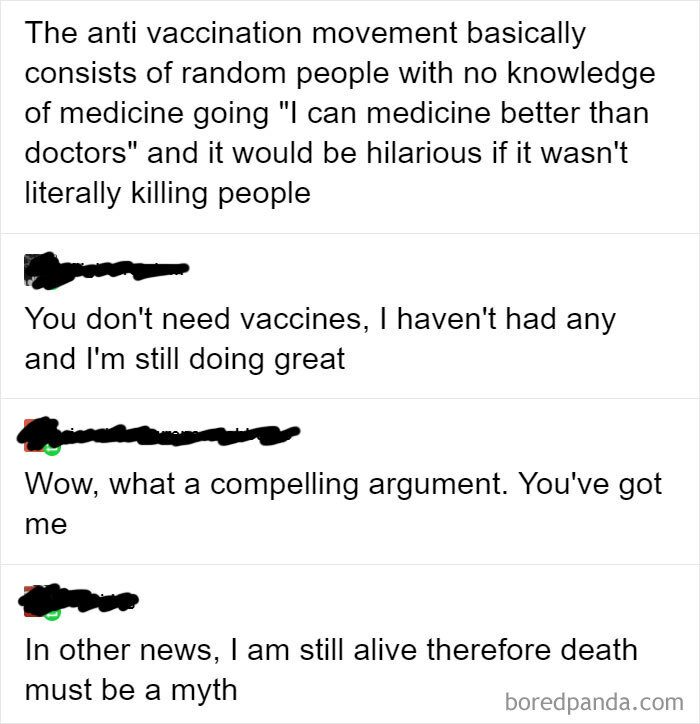 Two sides have spirited debate over vaccinations.